I’m about to finish my 5th book of the year (matching my 2018) and I want your help to pick my next read! They’re both by one of my favorite authors, Michael Connelly. The first is The Late Show, which introduces Detective Renee Ballard to the world. The second is The Lincoln Lawyer, which is the first in the Mickey Haller series. I’ve gotten some exposure to him because he’s related to Harry Bosch, but I haven’t read anything with Renee Ballard yet. She was featured in another book last year. I KNOW some of y’all will love every minute of this. Now watch! What else do I need to say? I’m sure you’ve noticed by now that I’m in the midst of a mad dash to complete my 2016 reading challenge. I finished two more books over the weekend to see if I can ultimately complete it. But today I’m talking about MY BOOK. I wonder if I’m making history right now by reviewing my own work. Hm. Anyway, let’s go. Divided Within is set in and around Houston and follows Andrew Banks as he works his first case as a private investigator. His first client happens to be a teenage girl who suspects there’s something really wrong between her parents that they aren’t telling her about, only it’s much worse than she could have imagined. A little history before I get into the good stuff. I wrote the book over the course of the first months immediately after I graduated from college in 2013. Although it’s my own work, I still had problems with it. The first thing I noticed is I obviously forgot how to use commas. Seriously. I’m not sure what was going on. There were commas where there should have been periods and then there was nothing where there should have been commas. Ugh. The other thing I didn’t really like after my reread was the language. It was unoriginal. It’s a crime novel, but I felt I used cussing at weird points in the story. I don’t feel like it worked. The other thing that I definitely recognize, though I still don’t have a problem with is the story. I won’t get into the specifics because some of you all might actually want to give it a read now, but one of the complaints I received when I first published the book was that the story was unbelievable. And it is. But I’ll keep saying it over and over again that I don’t read any fiction to read something that’s entirely realistic. If that’s what I want then I’ll watch the news. After more than three years my favorite aspect of the book is still Andrew and Sydney. I found a few points in which I didn’t like their dialogue, but their relationship is great. So many detectives have a new love interest every other book, but not Banks. You know that just from reading this first book. I still find it crazy that I wrote this thing, but I did and it’s mine. It satisfied the requirement to read a self-published book for my 2016 reading challenge. Have YOU read it!? Have you ever tried to review your own work? Sue Grafton is one of the most respected authors today. She’s written the Kinsey Millhone series of books set in California. I’ve read five or six books in the series, which I found underwhelming. And now she’s making THESE statements? No. BOOKS ARE NOT THE PERFECT GIFT. NO MATTER WHO SAYS SO. And signed books are meaningless in today’s world. 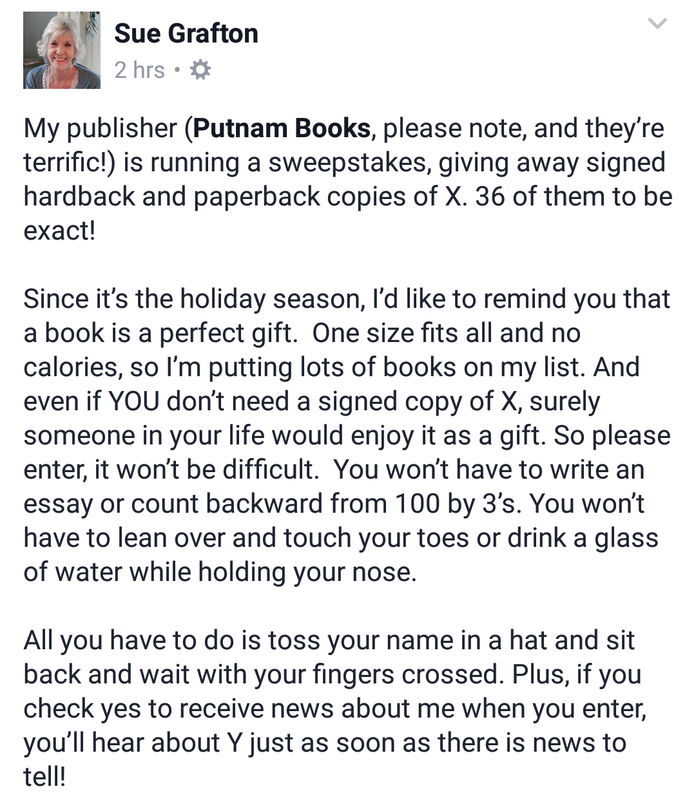 The only positive from this post is that the books are free, but even then I wouldn’t force any book onto any other person. Ugh. I’ll keep saying it until I no longer can. Books are terrible gifts. THE END. Especially books that have been on bookstore shelves for more than a year.